§ 59. THE solemn day of the nativity of our Lord was scarcely over, when the man of God, Cuthbert, returned to his dwelling on the island. A crowd of monks were standing by as he entered into the ship; and one of them, an old and venerable monk, strong in faith but weak in body, in consequence of a dysentery, said to him, “Tell us, my Lord Bishop, when we may hope for your return.” To this plain question, he replied as plainly, “When you shall bring my body back here.” When he had passed about two months in the enjoyment of his rest, and had as usual subdued both his body and mind with his accustomed severity, he was suddenly seized with illness, and began to prepare for the joy of everlasting happiness, through pain and temporal affliction. I will describe his death in the words of him who related it to me, namely, his attendant priest Herefrid, a most religious man, who also at that time presided over the monastery of Lindisfarne, in the capacity of Abbot. § 60. He was brought to the point of death, said he, after having been weakened by three weeks of continued suffering. For he was taken ill on the fourth day of the week; and again on the fourth day of the week his pains were over, and he departed to the Lord. But when I came to him on the first morning after his illness began—(for I had also arrived at the island with the brethren three days before)—in my desire to obtain his blessing and advice as usual, I gave the customary signal of my coming, and he came to the window, and replied to my salutation with a sigh. “My Lord Bishop,” said I, “what is the matter with you? Has your indisposition come upon you this last night?”—“Yes,” said he, “indisposition has come upon me.” I thought that he was speaking of an old complaint, which vexed him almost every day, and not of a new malady; so, without making any more inquiries, I said to him, “Give us your blessing, for it is time to put to sea and return home.”—“Do so,” replied he; “go on board and return home in safety. But, when the Lord shall have taken my spirit, bury me in this house, near my oratory, towards the south, over against the eastern side of the holy cross, which I have erected there. Towards the north side of that same oratory is a sarcophagus covered with turf, which the venerable Abbot Cudda formerly gave me. You will place my body therein, wrapping it in linen, which you will find in it. I would not wear it whilst I was alive, but for the love of that highly favoured woman, who sent it to me, the Abbess Verca. I have preserved it to wrap my corpse in.” On hearing these words, I replied, “I beseech you, father, as you are weak, and talk of the probability of your dying, to let some of the brethren remain here to wait on you.”—“Go home now,” said he; “but return at the proper time.” So I was unable to prevail upon him, notwithstanding the urgency of my entreaties; and at last I asked him when we should return to him. “When God so wills it,” said he, “and when he himself shall direct you.” We did as he commanded us; and having assembled the brethren immediately in the church, I had prayers offered up for him without intermission; for, said I, it seems to me, from some words which he spoke, that the day is approaching on which he will depart to the Lord. § 61. I was anxious about returning to him on account of his illness, but the weather prevented us for five days; and it was ordered so by God, as the event showed. For God Almighty, wishing to cleanse his servant from every stain of earthly weakness, and to show his adversaries how weak they were against the strength of his faith, kept him aloof from men, and put him to the proof by pains of the flesh, and still more violent encounters with the ancient enemy. At length there was a calm, and we went to the island, and found him away from his cell in the house where we were accustomed to reside. The brethren who came with me had some occasion to go back to the neighbouring shore, so that I was left alone on the island to minister to the holy father. I warmed some water and washed his feet, which had an ulcer from a long swelling; and from the quantity of blood that came from it, required to be attended to. I also warmed some wine which I had brought, and begged him to taste it: for I saw by his face that he was worn out with pain and want of food. When I had finished my service, he sat down quietly on the couch, and I sat down by his side. § 62. 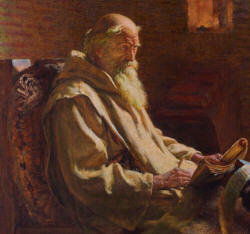 Seeing that he kept silence, I said, “I see, my Lord Bishop, that you have suffered much from your complaint since we left you, and I marvel that you were so unwilling for us, when we departed, to send you some of our number to wait upon you.” He replied, “It was done by the providence and the will of God, that I might be left without any society or aid of man, and suffer somewhat of affliction. For when you were gone, my languor began to increase, so that I left my cell and came hither to meet any one who might be on his way to see me, that he might not have the trouble of going further. Now, from the moment of my coming until the present time, during a space of five days and five nights, I have sat here without moving.”—“And how have you supported life, my Lord Bishop?” asked I; “have you remained so long without taking food?” Upon which, turning up the couch on which he was sitting, he showed me five onions concealed therein, saying, “This has been my food for five days—for, whenever my mouth became dry and parched with thirst, I cooled and refreshed myself by tasting these;”—now one of the onions appeared to have been a little gnawed, but certainly not more than half of it was eaten;—“and,” continued he, “my enemies have never persecuted me so much during my whole stay in the island, as they have done during these last five days.” I was not bold enough to ask what kinds of persecutions he had suffered: I only asked him to have some one to wait upon him. He consented, and kept some of us with him; amongst whom was the priest Beda the elder, who had always been used to familiar attendance upon him. This man was consequently a most faithful witness of every thing which he gave or received, whom Cuthbert wished to keep with him to remind him if he did not make proper compensation for any presents which he might receive, that before he died he might render to every one his own. He kept also another of the brethren with him, who had long suffered from a violent diarrhœa, and could not be cured by the physicians; but, for his religious merit, and prudent conduct and grave demeanour, was thought worthy to hear the last words of the man of God, and to witness his departure to the Lord. § 63. Meanwhile I returned home, and told the brethren that the holy father wished to be buried in his own island; and I added my opinion, that it would be more proper and becoming to obtain his consent for his body to be transported from the island, and buried in the monastery with the usual honours. My words pleased them, and we went to the bishop, and asked him, saying, “We have not dared, my Lord Bishop, to despise your injunction to be buried here, and yet we have thought proper to request of you permission to transport your body over to the monastery, and so have you amongst us.” To which he replied, “It was also my wish to repose here, where I have fought my humble battles for the Lord, where, too, I wish to finish my course, and whence I hope to be lifted up by a righteous Judge to obtain the crown of righteousness. But I think it better for you, also, that I should repose here, on account of the fugitives and criminals who may flee to my corpse for refuge; and when they have thus obtained an asylum, inasmuch as I have obtained the fame, humble though I am, of being a servant of Christ, you may think it necessary to intercede for such before the secular rulers, and so you may have trouble on my account.” When, however, we urged him with many entreaties, and asserted that such labour would be agreeable and easy to us, the man of God at length, after some deliberation, spoke thus:—“Since you wish to overcome my scruples, and to carry my body amongst you, it seems to me to be the best plan to bury it in the inmost parts of the church, that you may be able to visit my tomb yourselves, and to control the visits of all other persons.” We thanked him on our bended knees for this permission, and for his advice; and returning home, did not cease to pay him frequent visits.